Join the discussion on our forums! Come discuss Eldritch Horror over in our dedicated Eldritch Horror discussion topic. So for 2 extra mana you get +3 health. 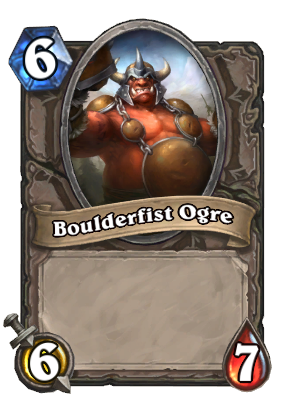 This card has got to be one of the worst cards in hearthstone. I have no problem with this card. It may not have done much, but at least it is a step in the right direction, and a decent arena card. Slap taunt on it and im playing this all day. Behold: the Giant Mastodon! Is it everything you hoped for and more? Basically a Captured Jormungar that has +1/+1 stats for 1 more mana. Nothing spectacular. Good in arena if you are looking for some biggies and can't find any Captured Jormungar or North Sea Kraken. Even better in arena than the 10-mana 10/10. Just trash in constructed. 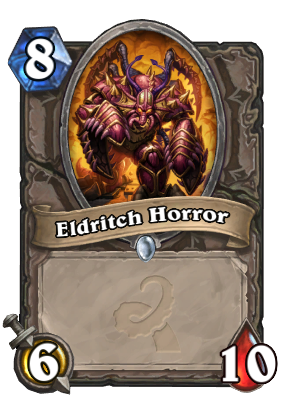 We all know this is not the best card by any means but it's good to see Blizzard making big minions common cards so new players would make more of a midrange/control deck over aggro. What legendary is this strictly worse than? I can't think of any. And i am pretty sure it´s meant to be a token card for transform effects and summon effects. Brought low and driven into the mud! Damn it I knew Forbidden Shaping at 8 mana was too good to be true. But I still think you're statistically more likely to get a good 8-mana card from it than a bad one, even with this guy polluting the pool. This card was obviously created with Arena in mind. I don't know why people whine so much about vanillas. If you don't play arena, just ignore it.